As a surrogate, you will be the one carrying the intended parents’ baby for nine months — but, because you will not be taking the baby home after birth, a baby who is used to your sound and smell can easily be shocked by an abrupt transfer to the intended parents. Fortunately, surrogacy professionals today understand the complexities involved in “attachment,” or the psychological connection between parent and child. While you will not form the same emotional attachment to your surrogate baby as you did with your own children, the baby you carry won’t know you aren’t their mother, and they may form an attachment to you. That’s why many surrogacy professionals today will emphasize the importance of incorporating intended parents into a surrogate pregnancy from the very beginning to ease this eventual transition. But, how exactly can you help intended parents connect to their baby if you are the one who is carrying him or her? 1. Allow them to talk to their baby. Babies have an extremely developed sense of hearing while they are in the womb. Scientists hypothesize that this is a way for a mother and her child to bond even before birth. However, when the baby is not the gestational carrier’s, a baby’s ability to hear can make things a bit complicated. Work with your intended parents to let them talk to their baby while in the womb, whether it’s in-person or through a recording. 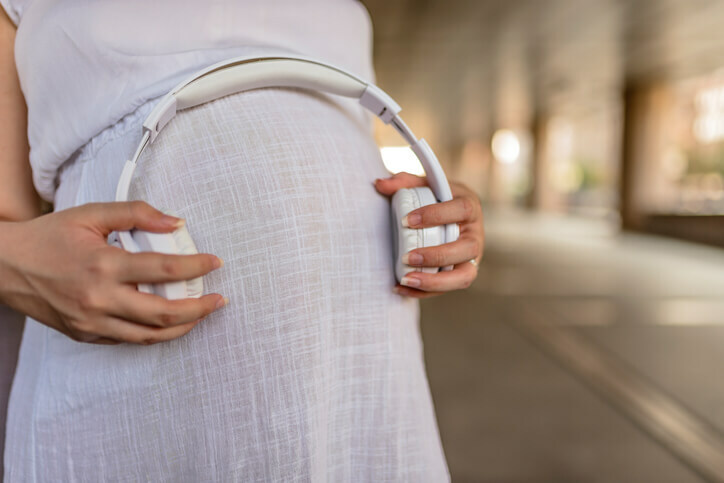 There are even particular headphones (called “Belly Buds”) that allow you to play recordings of the intended parents’ voices directly to your abdomen, helping the baby bond to the sound of their parents’ voice. Many surrogates recommend these headphones for this very purpose. 2. Involve them in important moments. As much as possible, find ways to involve your intended parents in important parts of your pregnancy. When the intended parents are present for appointments like sonograms and gender determinations, it helps them feel as though they are a part of your pregnancy experience. Seeing their baby on the sonogram screen or feeling their baby kick through their fingers can give them a sense of wonder that no emailed pictures or recordings ever could. If your intended parents are not logistically able to be a part of these moments in person, make sure to follow up with your pictures, descriptions and recordings electronically. 3. Accustom the baby to the intended parents’ environment. The shock of coming into the world can be abrupt enough but, when babies are placed into environments they aren’t familiar with, it can be even more so. Find out what kind of music the intended parents play, what kind of food they cook, and more, so that you can help the baby experience those sounds and smells from inside the womb in your own home. 4. Confirm the baby’s senses after birth, and then promote as much skin-on-skin contact as possible. When the baby is first born, you will need to confirm their sense of touch and smell directly, as you are the person they have become accustomed to for the last nine months. However, once appropriate time has passed for the shock of coming into the world to subside, you should encourage intended parents to have as much skin-on-skin contact as possible. An intended mother may even choose to breastfeed her child, whether with her own milk or yours, as a way to further bond with her child after birth. 5. Provide a transitional item after birth. No matter how much preparation is done, there will always be a difficult transition for a baby born via surrogacy. To aid in that, many surrogacy professionals recommend that surrogates provide a transitional item to send home with the baby, like a stuffed animal. Before the baby is born, sleep with this stuffed animal so it carries your scent. When you give it to the intended parents, the baby will have a familiar scent to go home with them as they adjust to their new environment. Remember, your surrogacy specialist at American Surrogacy will always work with you and the intended parents to provide as positive a bonding experience during your pregnancy as possible, as well as prepare you and them for the transitional period after birth. For more suggestions and to learn more about the surrogacy process, please contact our agency today.